The B Braun 0.2 Micron Filtered Extension Set with CARESITE Injection Site is 16 inches in length with a Priming Volume of 5.2 mL. This IV extension set is designed with a 0.2 Micron filter to remove any particles from the IV when patient receives intravenous fluids or medications. An extension set also puts additional space between the IV and the patient when controlling the flow rate. It also features a needleless design and uses a CARESITE needleless connector type. This prevents accidental needlesticks and makes it fast and easy for healthcare workers to connect. 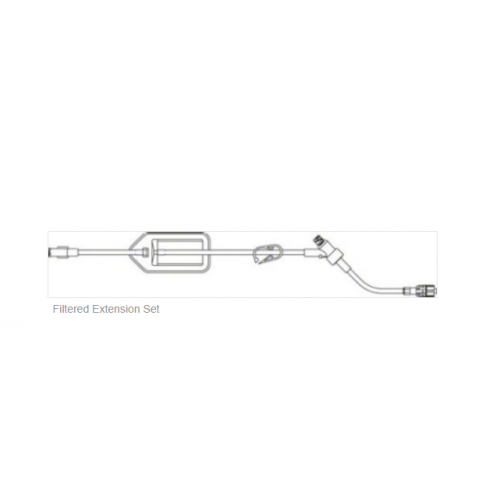 This extension set also features the SPIN-LOCK connector design that prevents the IV catheter from being pulled out accidently. For patient safety, B Braun manufactures these sets void of latex and DEHP. The 0.2 Micron Filtered Extension Set with CARESITE LAD Needleless System comes in a case of 50. You may also want to check out B1000 Replacement Caps by B Braun used to cap the IV catheter. I am a pharmacist at Christiana Care Health System in Newark Delaware. I would like to verify that this item SKU 354221 has a low protein binding filter and is it made of polyethersulfone. We obtained information directly from the manufacturer, who stated "this item does have a low protein binding filter and it is made of polyethersulfone."